Technology is all around us, and getting our children productively engaged in technology can be a challenge. The benefit of having so much technology available to our children is that the number of opportunities to explore new fields and interests has grown considerably. 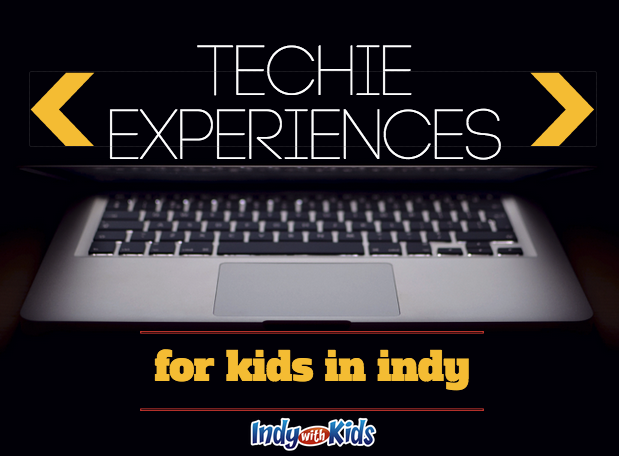 The Indy area provides a range of techie experiences for children of all ages, ranging from learning new skills to using technology to building social engagement. Carmel Clay Parks and Recreation offers a variety of technical experiences for children of all ages from their Software Engineering and Programming courses for children ages 8-11, to Robotics classes for 11-15 year olds, to Junior Mechanical Engineering for 4-8 year olds. Indianapolis Public Library offers a number of free adult classes and courses ranging from basic word processing skills to eReader exploration, that older school age children may find beneficial, as well. For 3-6 year olds, check out the Digital Littles Lab events that take place at the College Avenue Branch library, where children can play with robots, create on iPads, and explore age appropriate apps. Live father north? Check out Noblesville Library’s Teen Tech Tuesdays where teens can create circuits, robots and more, or beginning on October 6th, participate in Minecraft Open Play from 4-7. Younger kiddos, ages 3-6, can participate in the Fishers Library Little Lab Preschool Science Workshops that explore a variety of science, technology, and engineering topics each month. Thursdays at the Greenwood Public Library is Video Game Tournament Day for teens in grades 6-12. Children ages 11-18 can challenge their friends to Super Smash Bros. Brawl, Wii Sports, Mario Kart, and Just Dance! Be sure to check the schedule, as tournament days change each session. The Apple Store at Keystone at the Crossing offers workshops for students on iPhone, iPad and Mac tips for school and educational usage each week, The Microsoft Store also offers classes such as Learn to Code, Madden Football Tournaments, and Technology Field Trips.